Dr. Kellum was born in Tupelo, MS, having been delivered by Dr. Walter Bourland, one of the founding members of OBGYN Associates. He received his early education through the Tupelo Public Schools. He went to the University of Mississippi for his undergraduate degree and graduated in 1981. He attended the University of Mississippi Medical School in Jackson, MS and graduated in 1985. He then did his residency in Obstetrics and Gynecology through the Greenville Hospital System in Greenville, SC, completing his work there in 1989. Along the way he married his wife Joy, a native of Tupelo, MS. They moved back to their hometown in 1989 with their two daughters Tyler and Darby where Dr. Kellum began private practice with OBGYN Associates. Dr. Kellum is certified by the American Board of Obstetrics and Gynecology and works to maintain that certification on a yearly basis. 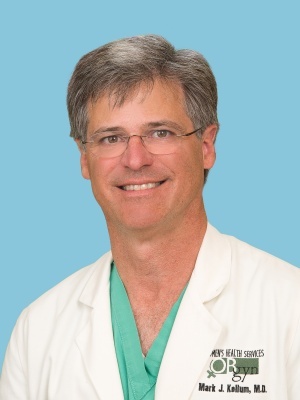 He has served as president of the Northeast Mississippi Medical Society and chairman of the North Mississippi Medical Center Department of OBGYN. He enjoys practicing both Obstetrics and Gynecology. Dr. Kellum’s family has now expanded to include Tyler’s husband Blake Jeter and Darby’s husband Will Kilpatrick. He is especially proud of his first grandchild Julia Jeter! Rounding out the family are Graham and Bella, two rescued Golden Retrievers. Dr. Kellum and his wife Joy, a nurse, enjoy working together on medical mission trips to Guatemala. If he’s not at work, on a sunny day you might find him riding his bicycle on the Tanglefoot Trail.